General Election season officially started as of Nomination Day on Tuesday, and last night marked the first night of rallies of many to come. 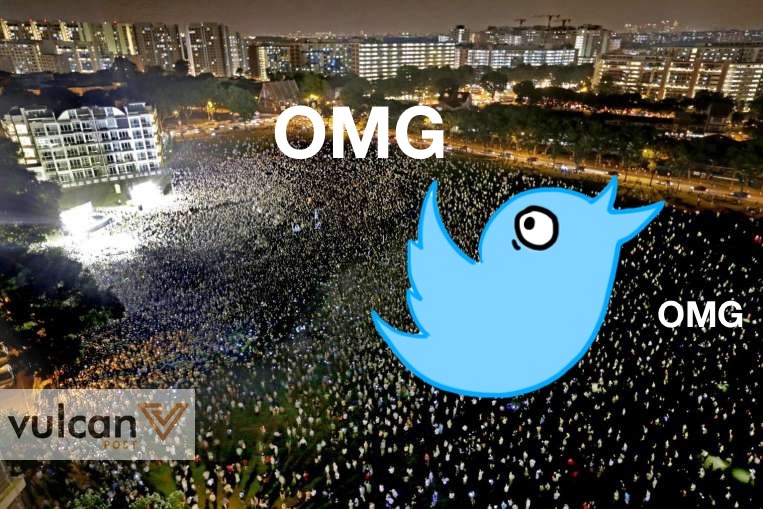 And with the General Elections in full swing, people have taken to Twitter to share their thoughts, experiences, and views, pushing #GE2015 to the top of the trending list in Singapore. In fact, Nomination Day brought so much traffic to the micro-blogging site that Twitter created a chart showing the most popular tweets on that day. The number of tweets peaked at 15,000 on that day alone. The most popular tweets focused on making fun of hilarious moments in the day, including the People’s Action Party’s (PAP) unfortunate poster disaster. Remember folks, the lamp post is upside down. Others shared their support for their favourite political parties. According to Twitter, the Workers’ Party seems to be getting the most love right now. But the star of last night was the Workers’ Party, who held their first rally in Hougang GRC. It attracted an insane number of people, pictures of which were shared on all social media platforms.